Now when [the wise men] had departed, behold, an angel of the Lord appeared to Joseph in a dream and said, "Rise, take the child and his mother, and flee to Egypt, and remain there till I tell you; for Herod is about to search for the child, to destroy him." And he rose and took the child and his mother by night, and departed to Egypt, and remained there until the death of Herod. But when Herod died, behold, an angel of the Lord appeared in a dream to Joseph in Egypt, saying, "Rise, take the child and his mother, and go to the land of Israel, for those who sought the child's life are dead." And he rose and took the child and his mother, and went to the land of Israel. 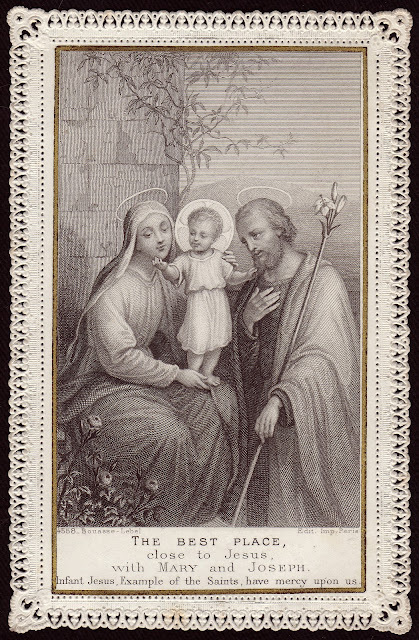 Just a reminder that the whole month of March is traditionally devoted to St. Joseph as I discussed in a previous article. The feast day of St. Joseph is March 19th which falls this year on a Saturday. I was thinking about St. Joseph this morning. I was contemplating his staff which is shown as budding with flowers. The story behind that is apparently that it was a sign from God that he should be the chaste husband of Mary and therefore the earthly father of the Messiah. It reminded me of the staff of Moses which turned into a snake. That made me wonder if in some sense St. Joseph was the new Moses – in the sense that Mary is the new Eve and Jesus is the new Adam. I thought about the fact that Joseph led his family into Egypt, while Moses led the Israelites out of Egypt into the desert. And yet the conclusion that I came to is that Joseph is such a unique person in the Bible that there is no one to compare him with. I was reading something recently that compared the "fiat" of Joseph with the fiat of Mary. It is very true that Joseph said "yes" to God in much the same way that Mary did. He never questioned God's authority. And the fact that Joseph had a very strong relationship with God is evidenced by the three times that angels appeared to him in his dreams. Once to tell him to accept Mary as his wife, once to tell him to take his family and flee to Egypt, and finally to tell him that it was time to leave Egypt. But the most amazing part about Joseph is simply that he was a father to the Son of God. He gazed daily upon the face of Jesus and watched him from birth growing into a young man. Like Moses, Joseph gazed upon the "face of God" and yet like Moses he never saw the promised land. He did not live to see Jesus proclaim the Kingdom of God. The Bible does not say anything about Joseph's death. Surely mystics throughout the history of the Church must have meditated on this mystery. Perhaps it is enough to know that he was "a just man".